Anyone who gets an easy sum like that wrong, should 'go forth & multiply'. Sums are obviously not my strong suit. Syl wrote: Sums are obviously not my strong suit. Try picking up the pace by increasing size of the distraptor. I think this is a trick thread. I don't 'get' it anyway. WHAT'S an "O level" ?!? Syl wrote: I think this is a trick thread. No. That just looks like me running around inside my own brain. 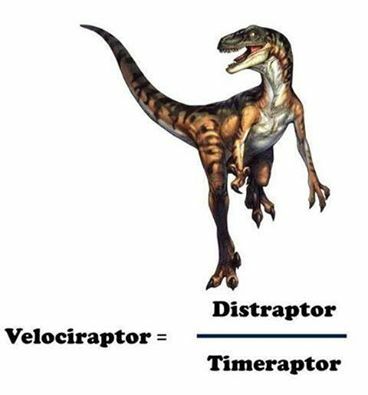 Some things are just too simple for sophisticated folk like you, Syl - step back, forget the raptor bit, and look at the equation again. Syl shall we start our own forum and talk about pixie dust and curtains? eddie wrote: Syl shall we start our own forum and talk about pixie dust and curtains? Yeah....who wants to solve puzzles when we can be girly airheads? Velocity = Distance/Time is a basic of physics, Victor just played magic games to take your eye off the ball. Speed is total distance divided by total time..
Is that all it is?? I bought into this whole "mystery" to be solved! sassy wrote: Velocity = Distance/Time is a basic of physics, Victor just played magic games to take your eye off the ball. Speed is total distance divided by total time.. Thanks Sassy.....but my brain is in deny mode and I don't even understand what the question was never mind the answer...or even the point of it all..
Is that you btw?....if so you are lovely. Gawd. Wake me up when you've finished. "I bet you say that to ALL the boys"
Well it takes a special type to keep me interested. Separate advanced science subjects (i.e. Chemistry, Biology, Physics, maybe Geology, Astronomy) are year 11 and 12 "elective subjects", under our national curriculum.. Under the New South Wales higher school certificate ("HSC") system, I did Biology and Chemistry as part of my HSC, along with English, Maths and Economics. I did what would be the equivalent of Physics 101 (i.e. University level) in my first year at Hawkesbury Ag' College (UWS)..
too much rot gut whiskey????????????????????????????????????????????????? » Sub-levels (subform) - how to put the word in front of the sub level links?